Take the guesswork out of sizing. Simply measure the circumference of your chest, 1" below your armhole, then correspond to the nearest "Body Size". Each Commonwealth shirt is made in one of three fits; the Standard Fit, the Utility Fit or the Women's Fit. Size charts included below. Don't trust your own measurements? Try one on first hand at 4th floor- 290 McDermot Ave or email andrew@commonwealthmfg.com with any questions! This is the signature Commonwealth fit - tailored but not too tailored. This is not your oversized 90's shirt and it's not your hyper-fitted-zero-mobility shirt either. Its a shirt that looks good on us regular folks. This fit is specifically designed for our workwear inspired shirts. 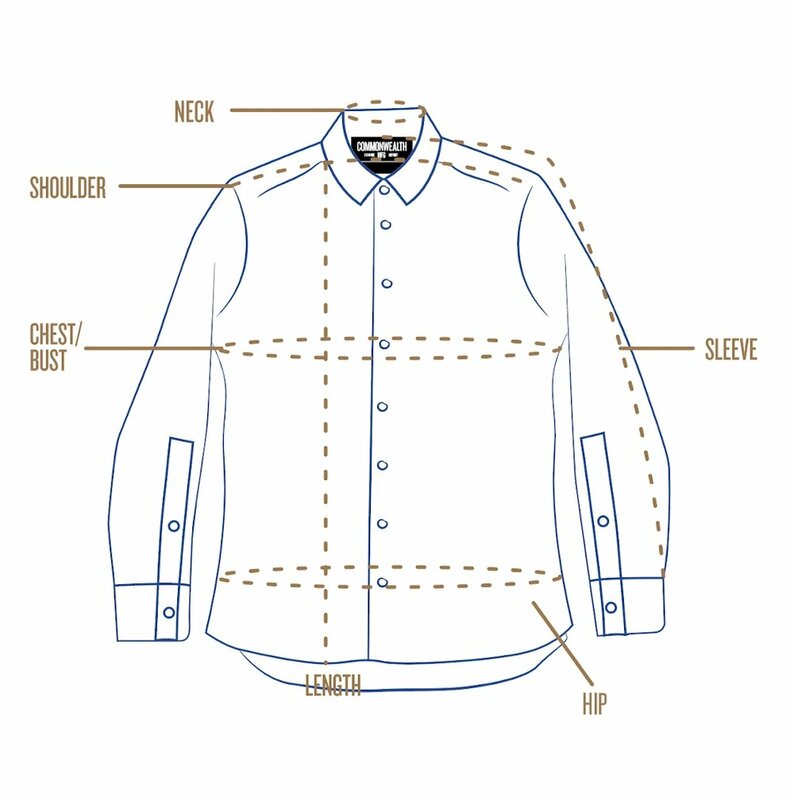 A re-shaped sleeve cap and added room in the Chest/Hip circumferences was created for increased mobility and a casual look. This fit is designed for a female physique. No bust darts have been included to make this a semi-loose shirt that still fits right on the shoulders and neck. Measure your bust at the greatest point and match with the "Bust Range" row, which represents your body size. The second row labeled "Bust" shows the approximate dimensions of the finished garment.